These high-quality pluggers are shaped to closely match the final root canal preparation. This maximises condensation forces on the softened obturation material without placing undue stress on the root canal system. 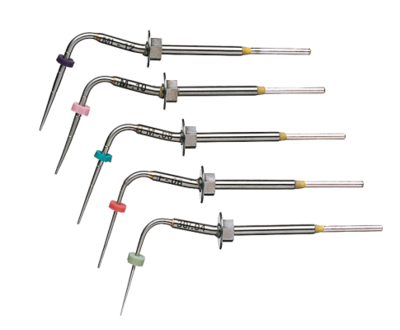 As the Elements obturation unit and the System B unit maintain a constant temperature during treatment, the obturation material is not over-softened by the Buchanan plugger and the warm mass fills lateral canals as easily as it seals apically. When you disengage the heat, the pluggers cool instantly and can therefore be separated easily from the obturation material. 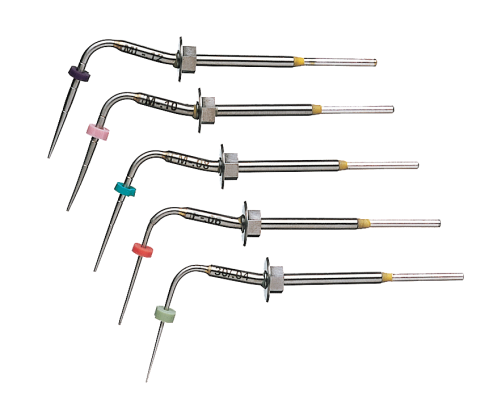 Featuring both a tapered NiTi end and a stainless steel end, Buchanan hand pluggers can be used in all common obturation techniques, including warm and cold condensation. The pluggers are also ideal for back-filling canals. Use the colour-coded NiTi end for finishing condensation procedures, even in the most radically curved canals. Both ends condense and control the gutta percha. The Buchanan hand pluggers are made to provide a long service life despite sterilisation and heavy use.